Paris one weekend, Rome the next! I’ve just arrived back in Cannes after a really fun and busy weekend in Rome! I apologize if this blog ends up being short – really tired and still have things to do! 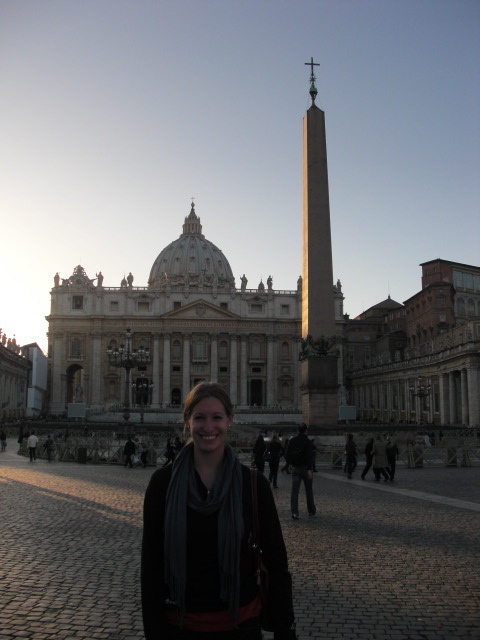 After three very short busy days at the College, I headed off to Rome with Megan, Leah, and Regina. We were going to meet up with Andrew, Evans and Ryan who had left the night before. We left pretty soon after morning class on Friday, and we left early since the Chinese president was visiting in Nice and Sarkozy was going to be there, so we were expecting a lot of traffic from blocked roads and a lot of security. We had no problems and we were at the airport super early! Always better to be early with these sorts of things, I suppose. This was my first flight with EasyJet – a very popular cheap airline here, similar to Ryan Air. We didn’t realize that when they said one bag, they meant ONE bag. Purses count as one bag – ugh! Luckily, we had enough room inside our real bags to fit our purses. We arrived in Rome just fine (less than an hour flight to get to Rome – how cool is that?) and had to take an express train to get into the city center – the airport is actually really far away from all the tourist sights. We made it onto the train just a few minutes before it left – and we arrived about 45 minutes later. We stepped out of the station and realized it was kind of a sketchy area – not the best well lit and tons of graffiti. Welcome to Rome. I wasn’t worried – there were 4 of us, and if you walk confidently and are aware of your surroundings, you’ll be fine. We had to find our new hotel – our reservation had changed. It was in a new location, but same owners. There was no reception area at the new hotel, so we had to call the owner to let us in. We found the hotel fairly quickly, but had to try several times before we reached the owner, Barbara, who only really spoke Italian. Luckily, she arrived within 15 minutes and the room was great – kind of apartment style without a kitchen. There was a big open entry room with a computer (free access!) and some things for breakfast. There were 2 huge bathrooms (both with a shower and bidet!) and we had a nice room with a double bed and 2 twin beds. Barbara was very helpful in telling us where we should go – she drew all over the map she gave me. We met up with the guys for dinner, and spent a calm evening enjoying bruschetta and pizza before deciding to call it an early night so we could get up early for a long day of sight seeing. The next day, Saturday, Leah and I split off since we were going to see the Vatican in the afternoon, and the others weren’t too interested in that. All of the tourist sights in Rome are actually really close together and it doesn’t take more than 15 minutes of walking between the sights. It was funny to us that Rome only has 2 metro lines, after we had just been in Paris which has the best metro in the world! We each bought a day pass for the metro, which gave us unlimited rides on the metro until midnight. We actually didn’t use the metro too much since the stops are not always convenient. Anyway – we set off toward the Colosseum in the morning – it was great! So hard to believe that something that old is still standing today. It’s impressively huge, and surrounded by tourists and a bizillion street vendors selling things like scarves, bouncy putty, and other trinkets. Again, we had the impulse to respond in French and one vendor brusquely corrected our Merci with Grazie. The lines were really long, and we didn’t think we would have time to see all of the Colosseum and the Roman ruins before we had to go to the Vatican. We had bought our Vatican tickets online the day before, for 1pm and we weren’t sure how strict the Vatican was about showing up on time for your ticket. We still had quite a bit of time before the Vatican, so we decided to go to the Trevi fountain. It was a bit of a walk, and we got turned around a few times (Roman streets are hard to follow! The name changes about every block, even though you’re on the same road). The fountain was beautiful, and mobbed by tourists. I can’t imagine how this place would be during high tourist season! We saw Regina, Andrew and Megan there and hung out with them a little bit. We each threw in a coin – if you throw a coin into the fountain, you’re destined to come back! 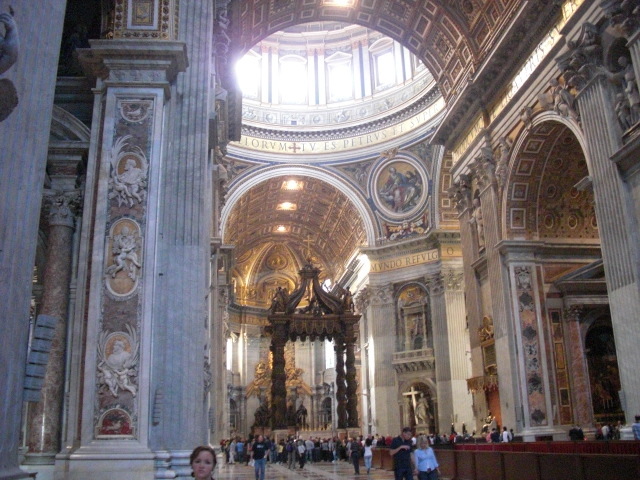 Leah and I continued to the Vatican, and had no problem getting our ticket. I didn’t see a long line to get in, but I was still happy that we had bought our ticket ahead of time. 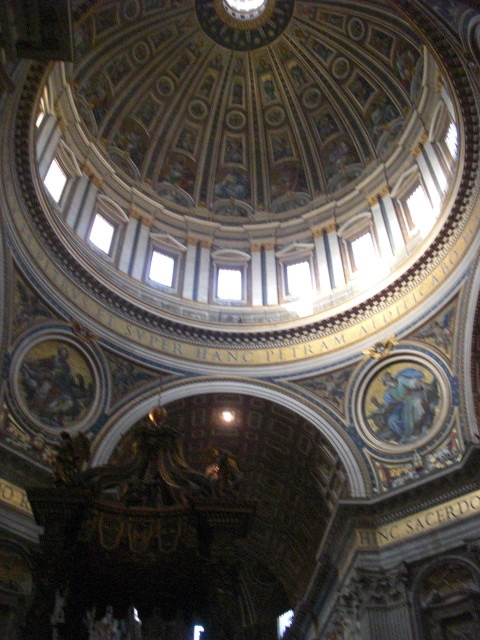 Everything in the Vatican was very decorated – kind of reminded me of Versailles. Every surface was covered in something – nearly always artwork – especially the ceilings! There are tons of museums there – we wandered through a couple before admitting to ourselves we weren’t interested and really just wanted to see the Sistine Chapel. We still had to walk through 10-15 more rooms of art before we made it there, and it was AMAZING. It’s overwhelming when you walk inside. Literally every surface is painted – and it’s all incredible. It was so much to take in all at once, and there are tons of tourists in there. The poor guys who have to work in there just wander around saying “No Photo” and “Silencio” (Leah and I did sneak a couple pictures…shhhh). 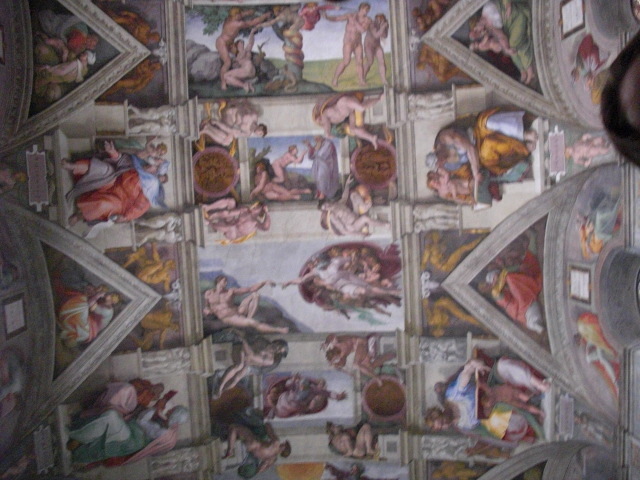 We stayed in there for a while, reveling in the fact that we were in THE SISTINE CHAPEL…before hunger drove us onward. We grabbed a quick bite of pizza at the Vatican pizzeria, since it wasn’t outrageously priced and we still wanted to see St. Peter’s Basilica. The Basilica was just as amazing as the Sistine Chapel – jaw dropping as you walk in just because everything is so decorated and ornate and it’s just SO BIG. 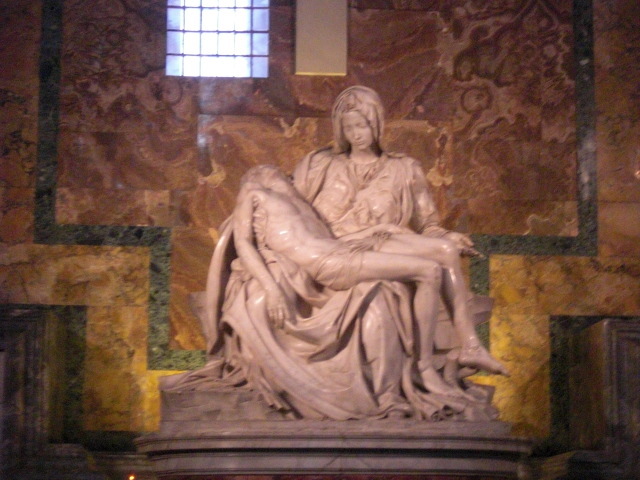 Also got to see Michelangelo’s La Pieta there, and St. Peter’s tomb. We couldn’t actually see the tomb, just the area where it was, but it was surrounded by people and it’s difficult to see anyway. We didn’t really want to leave the Vatican, but we were so tired at that point that we had to keep moving to not fall asleep everytime we sat down! 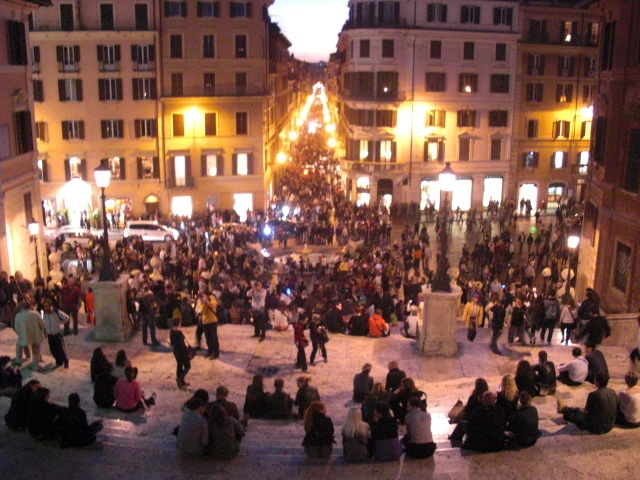 We headed to the Spanish Steps to spend a little time there and ran into Regina, Andrew and Megan again! Kind of amazing we found each other since there were so many people there! There was a military brass band playing, so it was nice to have some music to accompany the gorgeous sunset. 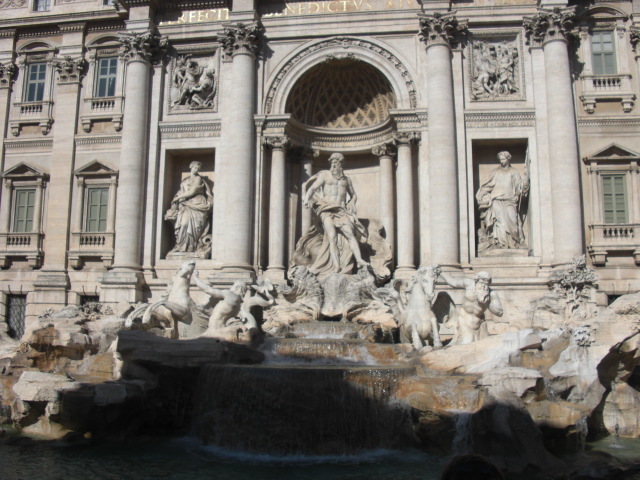 We all headed to the Trevi fountain to see it again at night (gorgeous!) and Leah and I went on a hunt for canolis. I had my first canoli (when better than in Italy?) and I liked it – though I think it’s too much filling for me. We headed back to the hotel to relax a little bit before dinner – which was amazing!! 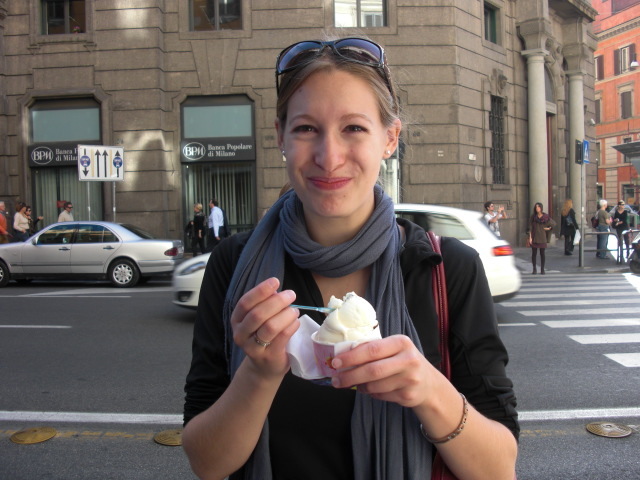 We went to a little place near the Colosseum called L’Archetto – a restaurant recommended to us by Megan’s friend. I had the lasagna – and it was so delicious!! 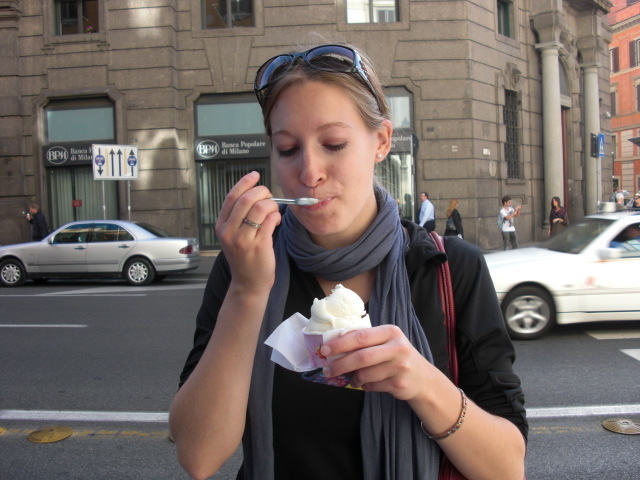 and tiramisu for dessert – I figured I should have it now before I left Italy, since I don’t know when I’ll be back. It was so delicious – and so nice to have such a great meal! Today, we woke up early because we were all going to go to the Colosseum before we had to leave to get on the train back to the airport. Only Megan and I ended up going, since the others thought it was too expensive. It was a bit more expensive than any other museums I’ve seen (it was 12 euro) but what’s 12 euro in the long run? How many times in my life will I have the chance to go into the Colosseum?? We did argue with the teller for a little while – he wouldn’t accept that we were E.U. students and therefore wouldn’t give us the student discount. Apparently a student visa and proof that we live here is not enough – to him, it had to be a European passport, not American. It’s things like this about Italy that make me prefer France. 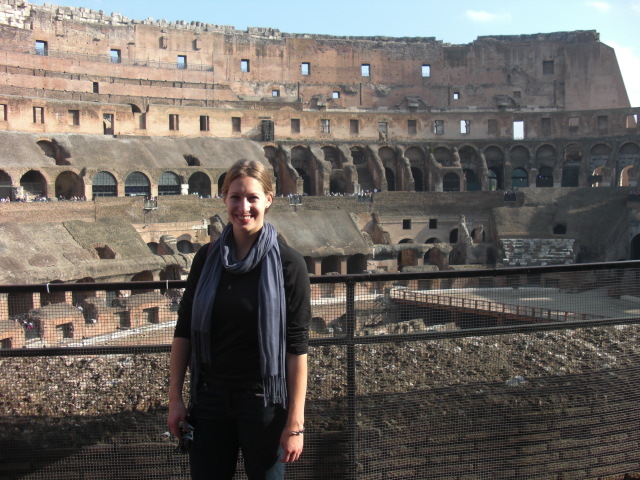 The Colosseum was great – so cool to see. 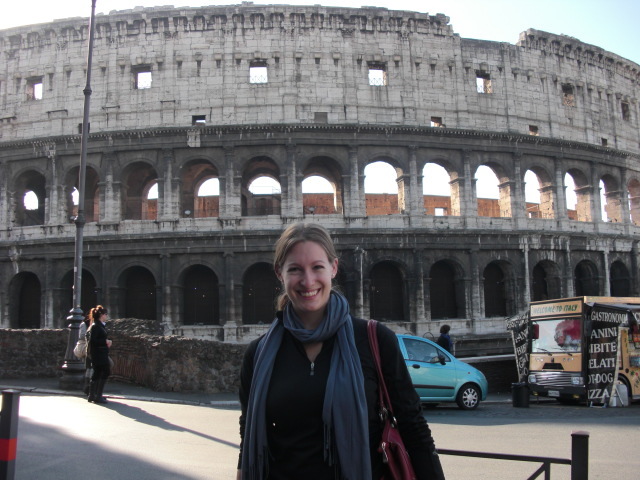 We walked around the Colosseum for a while and then wandered around the Roman ruins nearby. Spending our Sunday morning wandering through thousands of years old Roman ruins, no big deal. I love study abroad. We made it back to Cannes safely and without problems (no getting stranded this time!). It’s too bad I won’t be going back to Italy again, though I’ve decided I prefer France. Time is definitely flying by now (very bittersweet!!). Now, only 3 days until Lyon! Enter your email address to subscribe to my blog and you will receive notifications of my latest posts by email!